Join Koky, an IFMGA certified mountain guide, on a 12-day, full-service, Mountaineering Course in the breathtaking Cordillera Blanca Mountain Range. Join me on a 12-Day Mountaineering Course in the Cordillera Blanca. 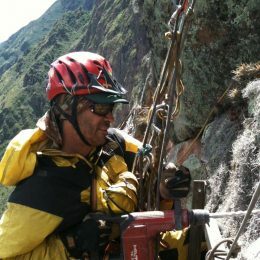 I will be guiding you not only through the course, but on a full service adventure within the Peruvian Andes. Learning is great, and in this case it is vital, but learning while enjoying some of the most incredible sights you will ever see is even better. Mountaineering is an activity that demands your respect. It is as enjoyable as it can be dangerous, so you need to know how to do it properly. There are several skills a successful climber must know before they begin climbing. Thus the need for a course like this. Some of the skills I will instruct you on include, Equipment Use and Care, Hazard Evaluation, Top Rope Management, Self and Team Arrest, Vertical Ice Climbing, Route Finding and Expedition Planning. We will also cover Glaciology and Altitude Physiology. You will learn the critical skills needed for Crevasse Rescue. Finally, on the last day, you will make an attempt to summit the majestic Mount Yanapaqcha (5,460m). 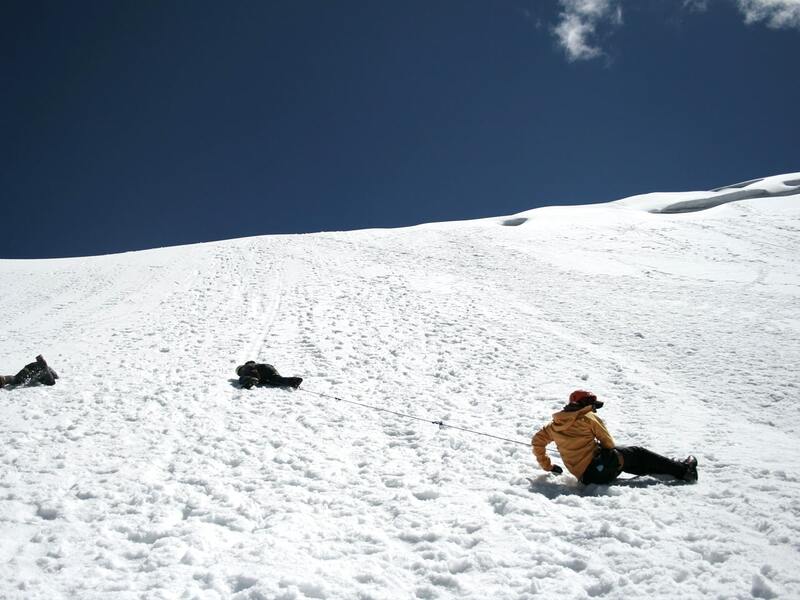 The course portion of this 12-Day Mountaineering Course is intensive, but not overwhelming. Leading up to the course portion however, you will get to enjoy some of the Cordillera Blanca’s most beautiful sights. You will see the turquoise water of the Laguna Churup and enjoy amazing views from the Peka Ventana. At the conclusion of the course, we will return to Huaraz, where you will enjoy a delicious Banquet Dinner. So come and enjoy the Peruvian Andes. Behold its beauty and marvel at its enormity, while also learning from experts the skills needed to explore its peaks responsibly and safely. Are you already in the Cordillera Blanca and looking to just take the 6-day course? If so, you can also do that here. Private pick-up at the Lima International Airport. Transfer to hotel for a nice meal and rest. Private transfer in the morning to the bus station. Take a comfortable first class, approximately 8-hour bus ride to Huaraz. Settle into hotel for the night. Orientation meeting in the morning in the hotel. Head out on a 4 hour acclimatization hike to the Puka Ventana (Red Window). Return to hotel for the night. Approximately 5 hour day hike to the Laguna Churup. Return to hotel for the night. Transport to Cebollapampa. Take one final acclimatization hike to Lake 69 (4,750m) then return to camp for the night. Climbers will wake up, eat breakfast, and pack up camp while waiting for transport to the Yanapaqcha trailhead. Upon arrival, climbers will hike for approximately 3 hours to base camp. Preliminary skills are the focus of the day, including, introduction to mountaineering and hazard management, equipment use and care, climbing knots and altitude physiology. Climbers will wake up at 6:30 am and have breakfast. Approximately 30 minute hike up to the ice. Focus on practical skills that includes, walking with crampons, kicking steps/following tracks, using an ice axe to walk and self belay, self arrest, team arrest, rope team travel techniques and snow/ice anchors. At around 4:30 pm descend back to camp for dinner and rest. Climbers will eat breakfast at 7 am. Class begins at 8 am. Morning spent learning belay systems, equalised anchors and haul systems. After lunch, entire afternoon is spent on the snow practising the important skill of “Crevasse Rescue.” Return to camp by 5:30 pm for dinner and rest. Climbers will leave campsite at 7:30 am. Head to ice to practice various techniques and scenarios of glacier travel. Climbers will be presented with problems they must solve using the skills they’ve practised and developed over last 2 days. Another crevasse rescue will be performed. Later on, climbers will head to an ice wall to learn a top-rope anchor system for ice climbing. After that, a pre-summit discussion will take place planning the following day’s climbing objective. Dinner will be served at around 5 pm. Climbers will wake up at 3 am, eat breakfast and gear up. They will head up to the glacier and begin the summit attempt in pre-established rope teams. Depending on snow conditions, weather, and team health/fitness, the summit can be reached in approximately 4-6 hours. Descent will take approximately 3-4 hours. Climbers should be back in camp by mid-afternoon for lunch and rest. 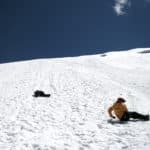 Those who wish to continue with skills practice will head back up to the glacier or to a location where instructor can work with anything climber still wishes to learn/practice. Climbers will eat breakfast at 7:30 am, pack up camp, and hike to the road where transport will be waiting to return them to Huaraz. Upon arrival at the Skyline Adventures base, gear will be unloaded and accounted for. Afterwards, climbers will return to their hotel and enjoy a celebration banquet. Last minute shopping for friends and family. Departing for Lima at 11 am and arriving at Lima International Airport or hotel at approximately 7:30 pm. All food on in-town days or extra food/beverages will not be included. Porters to carry personal equipment into/out of base camp will not be included. Additional porters can be contracted by climbers as requested at an additional cost.